...we invite them to the big top during the day when it’s quiet and they meet me and our other clown, but they meet us in our normal, everyday guises, not in makeup or anything. And then we take them into the circus ring, and they watch us as we slowly transform ourselves into our clown personalities. We put on our makeup very slowly, and then we put on our costumes. 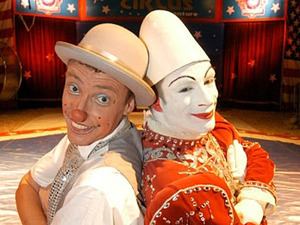 And if that goes well and they haven’t run for the door, we then try and get them interacting with us in the circus ring. We go through a few clown routines, getting them involved. And if that goes well, our ultimate aim is to get the person themselves dressed up in costume and makeup, and then we help them find their own inner clown..they come into the circus being scared, and then they end up leaving as a clown themselves. Hmm…I’m not sure ’bout that. 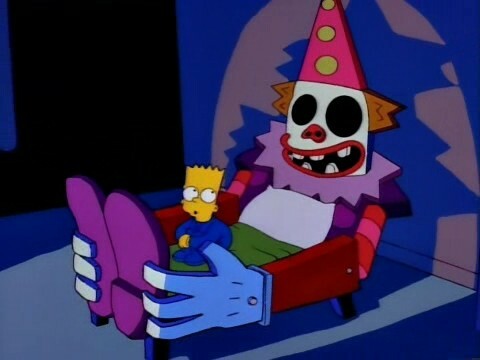 Finding my inner clown sounds pretty good, but why do I keep thinking of Stephen King and Chuckie? I knew a real clown who was truly funny. I met Amelia Mullen, aka, Pansy Potts the Clown, at the Sacramento Storyteller’s Guild. There seem to be two general ways of telling a story to a crowd, either in “quiet” way of a storyteller around the campfire, or in the dynamic way of an actor on a stage, the way vaudeville must have been. My way is very much the former, while Amelia worked the crowd, strutting across the stage with gestures and wild voices. No one fell asleep when she was telling a story. I later realized she developed this style of storytelling as a way of keeping the attention of rowdy four year olds while entertaining at birthday parties – now there is something to give you a phobia! This entry was posted in humor, Psychology and tagged humor. Bookmark the permalink. Nice to know there is a name for my Stephen-King-induced condition. I’ve been terrified of clowns ever since I read It. I wonder how many lives he’s ruined. I can’t stand two-year-old boys since Pet Sematary. Good thing I wasn’t a pre-school teacher.